COMPANY PROFILE Genscript Biotech Corp an investment holding firm. It is involved in the business of fundamental life sciences research, translational biomedical research and early stage pharmaceutical development. Genscript Biotech Corp an investment holding company. It is involved in fundamental life sciences research, translational biomedical research, and early stage pharmaceutical development businesses. Its services comprise clustered regularly interspaced short palindromic repeats, site-directed mutagenesis, plasmid DNA preparation, ORF cDNA clones and E.Coli protein production. The firm’s products include Cas9 nuclease proteins, the elite antibodies, epitope tag antibodies etc. At the price of HKD13.22 as at 29 Sep 2018, Genscript Biotech Corp is trading at a Price to Sales Ratio of 14.7 times last 12 months sales. 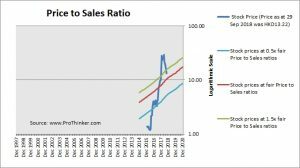 This is a 29.0% premium to current fair Price to Sales Ratio of 11.4 times. 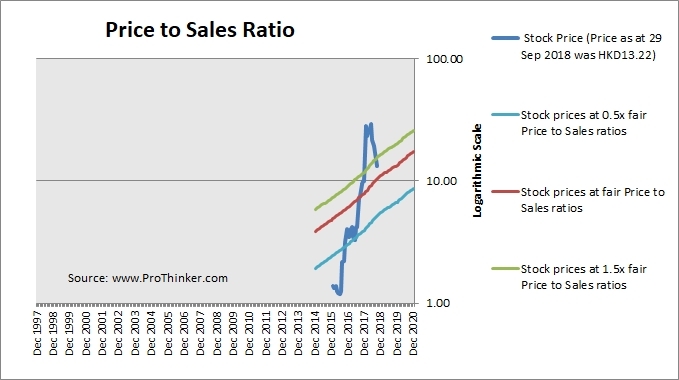 The historical average Price to Sales ratio cannot be determined with accuracy due to the short period of analysis.